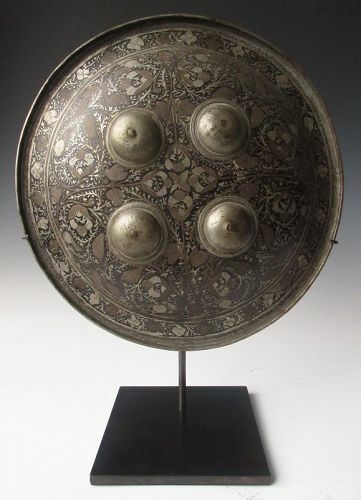 Antique Indian damascened hand shield. Silver on copper, engraved decoration with black enamel ground. Mounted on a custom antiqued bronze stand presentation. 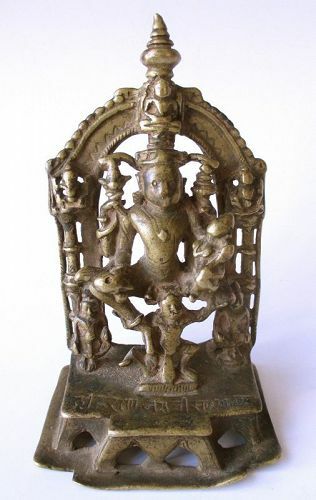 Small Indian Jain bronze of a seated Vishnu. His wife, Lakshmi is seated on his left knee. Vishnu hold his attributes, the conch shell in his upper right hand and Sudarshana Chakra (discus) in his upper left. Patina and traces of vermillion pigment. The faces of both deities are smooth from years of reverent handling. 2 3/4" high x 1 7/8" wide x 1 1/2" deep. 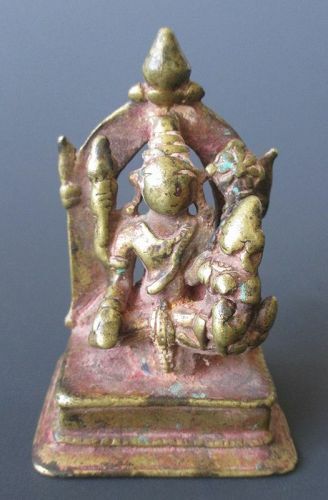 Small Indian Jain bronze depicting the seated figure of Vishnu with Lakshmi seated on his left knee. Lakshmi, the inseparable energy of Vishnu, sits with her right arm around Vishnu's waist. Below him on the rectangular platform is the tiny figure of his vehicle Garuda, identifiable by his tiny but unmistakable wings. 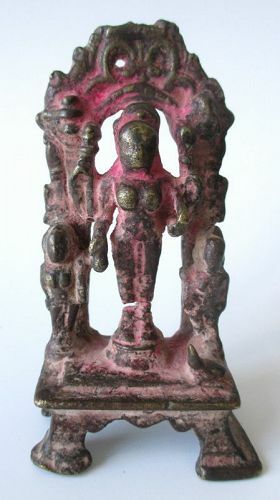 Two other smaller figures hold up each of Vishnu's knees. 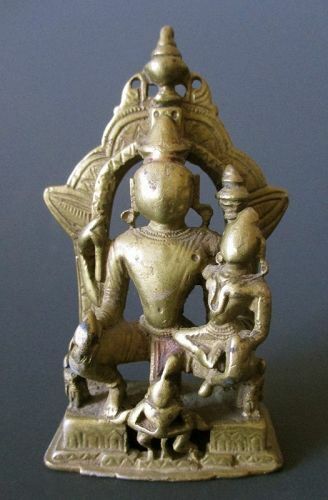 Indian Jain bronze figure of Vishnu with Lakshmi seated on his knee. Six other figures are present including 2 attendants on the bottom. The figure on the bottom is their friend and vehicle, Garuda. Incised with writing on the base and back. Dimensions: 5 5/8" high x 3 1/4" wide x 2 1/2" deep. A Sikh Perso-Indian mughal koftgari dagger, decorated with damascene silver handle and sheath with the head of a leopard. The blade is curved and inlaid with silver medallion filigree. 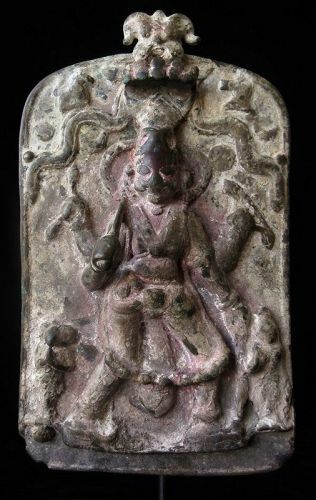 Four-armed sword wielding Virabhadra is a manifestation of Shiva. In this form, he decapitated the demigod Daksha who had insulted him, but in doing so, he interrupted the demigod's sacrifice by which all beings are created. Virabhadra later revived Daksha by replacing his head with that of a goat, thus ensuring the demigod survived and the continuance of creation. 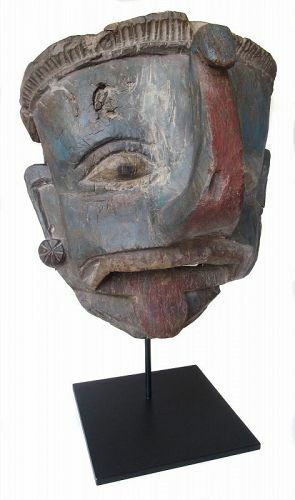 Mounted on Custom Iron Mount for presentation.